Westworld fans can now have the perfect Dolores iPhone case to protect your phone. The Westworld iPhone case is available for a whole range of phone models you can get one for the iPhone X and and iPhone 4 and everything in the middle and maybe when you read it a new iPhone is out and then just click on they the picture to see if it is available for your device. There is a version for Samsung phones to so come check out what models are available. On the iPhone case you can see a portrait of Dolores Abernathy and like we have seen before a fly is just walking close to her eye and she does not bothered by it at all. Now there are Batman and Robin iPhone 8 and X cases that just look stunning on your phone. 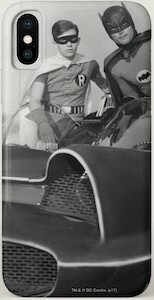 The iPhone hard case shows the Batmobile with Batman and Robin sitting on top of it and it a black and white picture from the classic TV series. And yes the hard case does allow wireless charging on devices that support it. The Batman phone case is made for many iPhone models like the iPhone X and 8 and 8 plus but also older models going back all the way to the iPhone 4 and when Apple makes new models then click the buy now button to see if it is available for your new iPhone. If you like Bob’s Burgers and would like your iPhone to look really cool then you want this Louise I Smell Fear On You iPhone skin. This is not a case just a vinyl decal specially made for your phone and it is easy to remove and install and the material is special as it will help with bubbles and scratches. 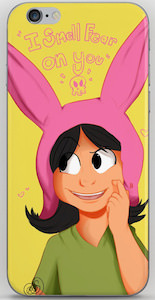 The iPhone skin is yellow and on it, you can see Louise Belcher and yes she does look different but still clearly is her and above her, between her bunny ears it says “I Smell Fear On You” and even has a little skull. You can get this Bob’s Burgers phone skill for many iPhone models so just click the buy button above to see if it is available for your phone. 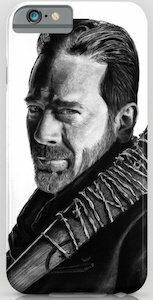 If you are a big fan of Negan from The Walking Dead then you just have to protect your phone in a case that has his picture on it. This phone case is white and on it, you can see a black and white picture of Negan with his bat Lucille on his shoulder. And many new devices will be added so if yours is not on the list still click the “Buy Now” button to see if it is available for your device. So make you phone look amazing thanks to Negan and the phone case is great at protecting your smartphone from damage too so don’t wait with protecting it. So you got that new phone and now you want a cool case and that is why you should check out this Wonder Woman OtterBox phone case. You can get this phone case for many Apple, Samsung, and Google phones like the iPhone 7 series, Samsung S8 series and the Google Pixels but there are many more so check them all out. The Wonder Woman case has a black border and on the back, you can see the classic Wonder Woman against a red background. 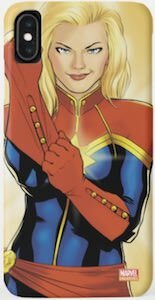 And the Wonder Woman case is an OtterBox and that means that it is made to protect your phone and keeping it look amazing. The always classic television series of Friends has many awesome characters and sayings. 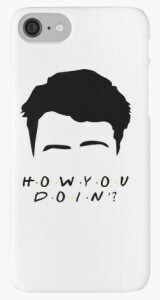 This iPhone case features Joey Tribbiani’s head silhouette with the trademark hair style and eyebrows along with his famous saying of “How You Doin?”. Made to precisely fit each phone type leaving you access to all ports, buttons and cameras. This case will help protect your precious iPhone from bumps, scratches and dents. Now your iPhone can be protected by Daryl from The Walking Dead thanks to this iPhone case. 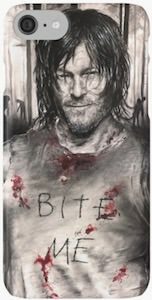 And if you like Daryl Dixon then this case will look stunning on your phone as it shows Daryl with a grin on his face wearing a t-shirt with blood stains and the words “Bite Me”. Of course, your phone deserves a cool case to make it be even more you and this The Walking Dead case with Daryl on it is just what you need. Homer Simpson from the classic carton television series and movies always over does it, especially when it comes to beer and donuts. 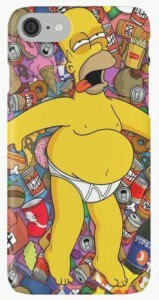 On this iPhone case you see Homer laying in a pile of empty beer cans, burgers, fries, ice cream and of course donuts. Homer’s tongue is hanging out and he appears to be in a beer and food coma. This case is available in the following Apple iPhone cases. Made to specifically fit each type of device leaving all ports, buttons and cameras open for use. It will help protect from bumps, scratches, and dust. 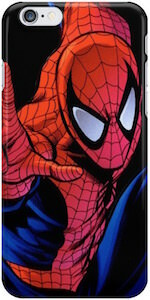 This Spider-Man iPhone case will protect your phone from harm while looking amazing. And if you iPhone is not in the list then just click on the “Buy Now” button to check if it is available now. On this iPhone case you can see an amazing looking Spider-Man picture and it looks like he really is coming at you right out of the case. And while protecting your phone Spider-Man will keep all your ports and buttons of you phone available for use.